Triocnemis saporis Grote, 1881, Papilio, 1: 77. Diagnosis: Triocnemis saporis is a distinctive noctuid unlikely to be confused with any other species in North America. The species has a stocky appearance and is primarily white. The base of the forewing and the subterminal area, in particular contrast with a black median area. 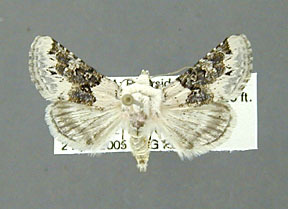 The outer margin of the forewing has a distinctive rich gray band. 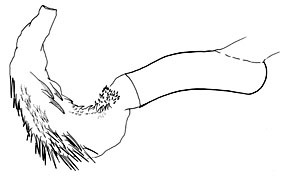 I am not sure I have interpreted the saporis situation correctly, but am currently considering saporis to be a single species with an uncommon degree of variability in the male genitalia and, to a lesser extent, superficial appearance. The differences are most marked in the male genitalia. The greatest areas of difference are in the shape of the valve, shape of the clasper of the valve, and the pattern of spining of the vesica of the aedoeagus. If this is a single species the clasper varies in shape and length. The longest clasper is found in southern California populations where it exceeds the costal margin and is recurved outward at its apex. In western Arizona populations the clasper barely reaches the costal margin and is straight. 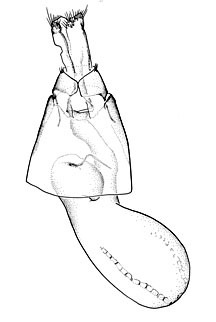 Specimens from western Texas have a very short clasper and the apex of the clasper is produced into multiple projections. In the basic vescia spining pattern there are two rows of spines. The outer row is located in a weakly rugose area. The inner row in typical specimens begins distally with a few large spines, the spines become smaller and denser as one proceeds towards the base of the vesica. In southern California specimens the distal spines of this row are large. However in western Arizona specimens these large spines are absent all together. Populations in Colorado represent intermediate conditions of development. There are superficial differences as well. Southern California and western Arizona populations are superficially identical. The typical populations of saporis occur through the desert regions of California, Oregon, Utah, Nevada, Arizona, and New Mexico. The population in central Colorado, however, is larger than other populations of saporis. There are too few specimens available to analyze the difference in any statistical manner. Secondly specimens from this Colorado population are much more inclined to have a distinct pinkish suffusion in the basal area of the forewing. This pink tinge does occur in typical saporis, but much less often. Perhaps the best superficial difference is in the hindwing. In this Colorado population the base of the hindwing is always pure white with a thin brown postmedial line and a gray band along the outer margin. This condition may be found in typical saporis but more commonly the base is suffused with gray. The differences between typical saporis and the west Texas population are equally subtle. Perhaps the best superficial difference is in the antemedial line. In typical saporis it projects outward triangularly in the region of the claviform spot. In the west Texas population while the antemedial line may project outward it is not distinctly triangular. The west Texas population on the whole appears paler and the blue gray patches in the subterminal area are not as distinct as in typical saporis. Distribution: Although I have interpreted this situation as a single geographical and individually variable species, this species may actually constitute a group of closely related sister species. Typical Triocnemis saporis is the widespread member of the group. The distribution is somewhat unique. The species occurs commonly in southern California and northern Baja California ranging eastward in southern Nevada, southern Arizona and southeastern New Mexico. The central Colorado population and the west Texas populations appear to be isolated from the rest of the species' range. The variability in these two populations was discussed above. It also occurs in the Great Basin region of southern and western Utah and Oregon. 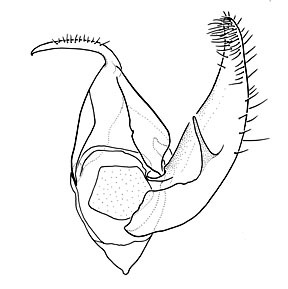 The only significant variation in the typical populations of saporis occurs in the hindwing. In some specimens the base of the hindwing is pure white with a fine brown postmedial line. In other specimens the base is suffused with gray and there is a white postmedial area contrasting with both the dark base and dark outer margin. A few specimens have a slight pink tinge to the base of the forewing. Geographical variation was discussed above. The vast majority of specimens have been collected in April and May. However a few specimens have been collected in the fall, possibly a partial second brood. Foodplants: The larva has been recorded from Eriogonum pusillum (Polygonaceae) by McFarland (1975). The larvae feed on the flowers and flower buds of the foodplant.